Anne Jewell, the mom who runs Louisville Slugger Museum & Factory, is sure to hit a grand slam homer with her first children's book, The Big Bat. This full color picture book spotlights the World's Biggest Baseball Bat, which stands 120 feet tall, weighs 68,000 pounds, and is the iconic symbol of the home of Louisville Slugger. 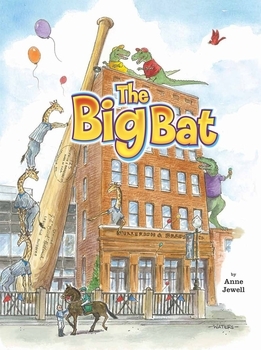 The Big Bat is the story of Katie and her little brother Ace, who arrive outside Louisville Slugger Museum & Factory and are captivated by the World's Biggest Baseball Bat. Katie wants to take a photo of it, but it's too big! As she and Ace try to get the best shot, they team up with dinosaurs, jellybeans, jockeys and more. And while the adventure is unfolding, readers are engaged with some zany yet educational math to illustrate just how big the Big Bat is! Jewell has dedicated the book to her 7-year old son, Joseph. "While I was on maternity leave after giving birth to my son, the idea of writing a children's book about the big bat helped me pass the time during those 3 a.m. feedings," Jewell says. "I wanted to create a story that parents and children would have fun reading together, because those are some of my favorite memories with my mom and dad, and I was looking forward to doing the same with my own child." The World's Biggest Bat is an exact-scale replica of Babe Ruth's 34-inch Louisville Slugger made by Hillerich & Bradsby Co. The signature on the bat is that of Bud Hillerich, who made the company's first bat in 1884. Hillerich & Bradsby Co., which is the parent company of Louisville Slugger Museum & Factory, remains a family-owned business. Illustrated in pen-and-ink and watercolor by Tony Waters of Charleston, South Carolina, The Big Bat is the third book written by Anne Jewell, who has been Executive Director of the Louisville Slugger Museum & Factory since 2004. Jewell's first two books are works of non-fiction and also explore great institutions in Louisville history: Legendary Lady: The Story of the Belle of Louisville (1999), and Baseball in Louisville (2003).